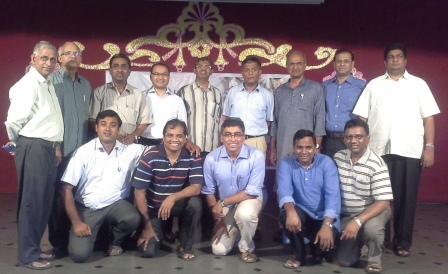 Hyderabad Sep. 5: Two day Governing body meeting of South Asian Young at Risk Forum was held on 4th and 5th of September 2015 at Don Bosco Navajeevan Rehabilitation centre, Ramanthapur, Hyderabad. Most of the members were present for the meeting. Hosting community Rector and province YaR coordinator Fr Bellamkonda Sudhakar welcomed all the participants and children welcomed them with band piece and through theme dance. It was much appreciated. Fr Raminedi Balaraju Salesian Provincial of Hyderabad and President of the South Asian Forum for Young at Risk addressed the participants. He said that YaR work is the work of the providence. The President in his address went on recalling from the past Chapter documents especially mentioning of GC 21 called upon every salesian to work for the rejected and unwanted children of our society. He also mentioned about GC 23 which speaks of the Educating the young and GC 26 we are called and send to serve the Young. He further said that we are meant to serve young people especially poorest of the poor. St. John Chrysostom said “Not to share our wealth with the poor is nothing but theft from the poor” in his concluding words he asked every participants to get rid of the mental pollution and think deeply, live wisely and love generously. Fr Tony presented the paper on the child friendly initiatives by National YaR Forum. He said we may be forth Non-governmental organization thinking towards this idea. Our focus should be for the children who need our support most. Other issues that were discussed forthing Annual YaR Seminar and Annual General Body Meeting. The dates of the seminar, AGBM and GBM yet to be decided. Fr Koshy proposed the vote thanks and thanked Don Bosco Navajeevan community for hosting and making feel at home every who came for the meeting.